Among other, Tickmokiller® fabric providing inherent mosquito and tick protection as well as inherent flame protection will be presented within the Future Forces Exhibition and Survivability Panel of the Future Forces Individual Systems Congress. CONCORDIA Textiles, founded in 1925, is a manufacturer of synthetic fabrics for end uses in professional workwear. With production facilities across 2 continents, Europe and Asia, we offer an optimal and flexible service to meet the global requirements of our customers. As a completely integrated textile manufacturer, we are weaving, dyeing, printing, finishing, coating and laminating fabrics. We develop and manufacture based on world class manufacturing standards such as ISO 9001, ISO 14001, Reach and Ökotex. For European army and police forces we became a reliable partner and have been for many years. We have been supplying most of them with fabrics used in the personal protective equipment of each soldier. Our products are used in sleeping bags, backpacks, garments (both flame retardant and/or waterproof & breathable), tactical vests and individual tents or sheet shelters. Our rotary screenprinting machine with up to 16 screens, our own design and development centre and our 40 years of experience enables us to print any camouflage pattern up to the specification of any army in the world. We specialize in printing on our own woven synthetic fabrics. Through the past 25 years we have printed over 80 different camouflage designs. Our in house colour and infra-red measurement equipment ensures our customers on the conformity to the stringent requirements all armies are putting forward on each and every colour separately. 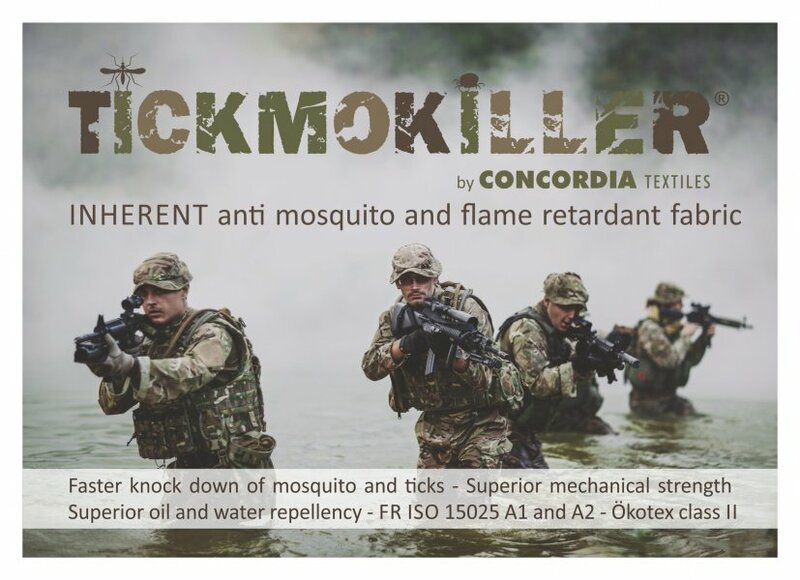 We recently developed our Tickmokiller® fabric, this patented fabric offers inherent mosquito and tick protection as well as inherent flame protection. We compared samples which are treated with permethrin and our inherent permethrin fabric. The results show that we have to use 35% less permethrin compared to treated fabrics to comply to the German TL 8305-0331 and after 100 washes up to 200% more active substances are remaining in our fabric. The Tickmokiller® is compliant to Ökotex class II and releases 3 times less amount of permethrin during 100 washing cycles than allowed by the TL8305-0331. After 100 washes according to ISO6330 60°C we have a 15% faster knock down of mosquito and ticks than requested in TL8305-0031. The fabric has superior oil and water repellency and is ISO 15025 A1 and A2 compliant. A special weave structure ensures superior tear strengths, with a weight of 210g/m² the fabric is 50% stronger than minimal requested in the TL8305-0342. For more information please visit CONCORDIA MILITARY.